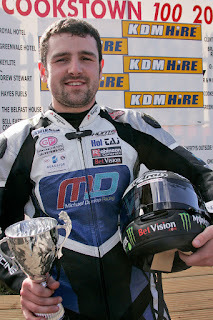 Fifteen times Isle of Man TT winner, Michael Dunlop will make his TYCO BMW Superbike debut at the forthcoming KDM Hire Cookstown 100 on Fri 27th/Sat 28th April. The Ballymoney rider will compete in both Open and Cookstown 100 Superbike races on board the TYCO BMW Superbike which he will race at the NW200, IOM TT & Ulster Grand Prix. Dunlop will also compete in the 600 Supersport race on board his MD Racing PTR Honda. Dunlops entry for the 96th Cookstown 100 adds to the already impressive list of competitors, which include his Brother William ,Derek McGee , Derek Sheils, Adam McLean and James Cowtown to name but a few. Dunlop last competed at the KDM Hire Cookstown 100 in 2015, he retired in the 600 race, finished second in the Open race on board the ill fated R1 Yamaha, and crashed out after taking the lead from Guy Martin in the Feature race! KDM Hire Cookstown 100 2018, Programme of Events. Annual Bikers Service with Rev Noel Agnew.